February 28, 2014 | Posted by Lee C.
You usually sense how much better you feel when you get a good night of sleep, especially when you get several full nights of sleep in a row. Did you know that sleep can also improve your physical abilities? A study published by the journal Sleep in 2011 followed the Stanford University basketball team to discover what impact extending the amount time spent asleep at night had on the player’s physical abilities. The researchers measured several physical activities performed while playing basketball, such as sprinting and shooting accuracy, during a period of 2-4 weeks. During that time the players slept for the amount of time they normally sleep every night. They also questioned the players regarding mood and general feelings of sleepiness. Then they required the players to sleep longer, spending at least 10 hours in bed every night for 5-7 weeks. Over the course of that period of time the players improved at both sprinting and accuracy in shooting. They also reported better mood and less sleepiness. If you are training for a marathon, playing volleyball on a recreational league, or even walking your dog, you may find your performance improved when you get a healthy dose of sleep at night. Even if you don’t play competitive sports, it is possible to conclude from this study that if you sleep well, you will feel better and be more physically capable of doing the tasks your day requires. Getting a few extra hours of sleep every night can help you feel more physically fit and feel better mentally and emotionally. Remember that the study was performed over a period of weeks. One extra long night of sleep after days on end of short nights will not offer a quick fix. To gain the physical benefits of sleeping well you must make a commitment to change your schedule so that you get an adequate amount of sleep on a regular basis. 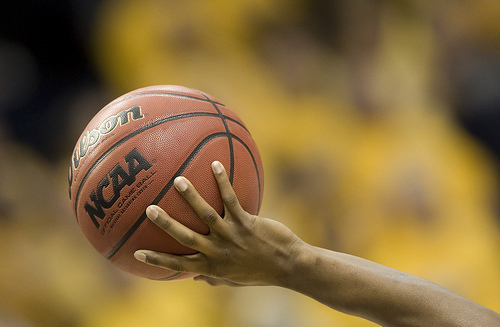 Unlike the college basketball players, you may not need ten hours of sleep every night to perform well, but you probably need more than seven. Sleep is essential to staying healthy and performing well. Do you notice feeling better when you get more sleep? How do you make sleep a priority in your everyday life? Eyelet lace is used for a trim on decorative items such as pillows. According to WiseGeek, eyelet refers to a small hole. You may be familiar with eyelet referring to the holes for laces in shoes. In embroidery, small holes that are delicately patterned with fine stitching around them make up eyelet lace. Eyelet lace is usually patterned in a floral motif, but it can come in other patterns like geometric shapes. Eyelet lace is used for trims on garments, bedding, tablecloths, doilies and more. It can even be used in crafting. It is easily applied with ModgePodge to cards, picture frames and scrapbooks. Eyelet lace trims can be ruffled or flat. Large panels are also be used to make up the entire piece rather than just the trim. Finished eyelet lace pieces can often be found at antique markets. Spools of of eyelet lace trim for crafting or sewing can be bought at craft supply stores. Eyelet lace usually comes in white, but can also be found in ivories and other off white colors. It can also be dyed to match the color of other fabrics. This style of lace usually gives an heirloom or country feel to decorating and clothing. Use a neutral eyelet lace bedspread to create a lovely country motif in your bedroom. This style of bedspread would complement refurbished antique furniture and recovered barn wood picture frames and art. Eyelet lace goes well with neutral colors on walls. Dusty blues, purples and pinks will also be very attractive with eyelet lace decor. In addition to bedspreads, you can also use small eyelet lace tablecloths to cover your nightstands. Eyelet lace table runners will work well to top dressers and drawers. 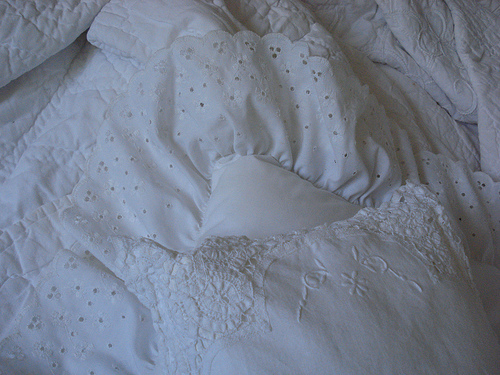 Cozytown Linens offers a beautiful, quilted eyelet lace bedspread in bone or white. They are quilted in a variety of patterns so you can choose one that matches your style. Eyelet lace is a timeless classic, useful for a variety of decorating situations. Lace will make a beautiful piece that can be handed down from generation to generation. Do you have any special lace pieces in your family? Image:”two pillows on my bed” by in pastel. Refresh old sheets with new color! The rejuvenated color will add a fresh look to your bedrooms and help your sheets look more like new. The easiest way to dye your sheets is in the washing machine. If you follow Rit’s instructions carefully and run an empty wash with detergent and bleach after your dye project, there is no risk of staining other clothes with stray dye. You can also dye your sheets in a bucket. Sweetly Inspired recommends using a large, plastic storage tubs for big dyeing projects such as sheets. This method is a bit more involved because you will be required to stir and mix the sheets yourself. Rit dye is very common to and easy to use. There are other options available as well such as Procion. Dyes are easiest to find at craft stores or online. Some require fixatives to keep the color from running or to brighten the color. Cotton and other cellulose materials will require salt to brighten the color. If you are trying to cover stains, you will want to use a dark color. Grays, browns, dark red, dark blue and dark green are all ideal for this kind of project. Rit’s website has a fun color chart that can help you choose a color and give you instructions for mixing the color. Be sure to wash your sheets and treat any stains before you dye them. This will help the dye go further in hiding any unsightly spots and spills. Apartment Therapy also suggests dyeing slip covers on furniture to bring new life to chairs and couches without having to reupholster. Not only will dye cover dingy, dirty fabric, but it will allow you to redecorate without having to buy new furniture. Refresh the color in any space with a few bottles of dye. Dye isn’t just for tie dying T-Shirts anymore. Don’t be afraid to be bold with your old sheets. If you planning to dispose them anyway, you have nothing to lose! With a bit of dye and some work you can update all of your old decor and give it a new flair. What creative ways have you used dye to restore and refresh old items? After a while white sheets may become dingy and grayed from continual washing and wear. You can make your sheets look like new again with a few laundry tricks. Lemon juice will help brighten and freshen your sheets without any harsh chemicals. Apartment Therapy suggests adding a half a cup of lemon juice to the wash along with your regular detergent. You can also soak your whites in boiling water witha sliced lemon. This soaking solution comes from One Good Thing. The author, Jillee, suggests mixing one cup of laundry detergent, one cup of powdered dishwasher detergent, one cup of bleach and half a cup of borax in enough extremely hot water to cover the white articles. Allow the white items to soak for a few hours and then wash them in a regular cycle. You can soak the sheets in large buckets, or right in the washing machine basin. Some items can lose their brilliance just from routine washing. If soap continues to build up without being thoroughly rinsed, it can make white items look gray and dingy. Try running these items through your wash several times with no soap. Tossing in some baking soda will also help remove residues. TipNut suggests soaking your clothes in a hydrogen peroxide solution. Use ½ cup of 3% hydrogen peroxide for every quart of cold water. Soak your garments or linens overnight and then wash as normal. Alternatively, you can put hydrogen peroxide directly into the rinse cycle. While drying clothes in the sun will cause your bright colored clothes to fade, it will also bleach out your whites. 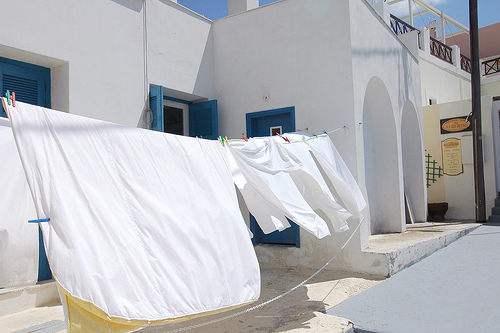 Hang your white sheets to dry in direct sunshine for a very natural whitener and brightener. 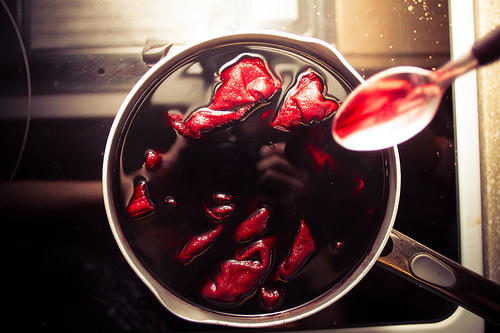 Add a ½ a cup of vinegar to the rinse cycle. The vinegar will help remove yellow dinginess from white sheets. Do not worry about the strong vinegar smell, it will dissipate quickly. Natural body oils and general wear and tear will turn white sheets to yellow and gray over time. Use these helpful methods to help restore your well used sheets to their former brand new brilliance. Do you have any tried and true laundry whitening tips to share?